I hope your summer is off to a great start. My summer has kicked into high gear. In addition to planning my upcoming March wedding….hope you’ve enjoyed all my wedding teaser posts on Facebook, I have released two books to whet your appetite while you’re on vacation, chilling on the beach or at home for a staycation. In June, my 21st book Cappuccino Kisses for Kimani Romance debuted to great reviews. If you haven’t picked up your copy of the Seattle Drayson’s Sprinkled with Love book, purchase your copy on Amazon http://bit.ly/capkisses, Barnes and Noble, Walmart or wherever books are sold. The sweetest merger of all… Triple chocolate cupcakes can help get a girl through the tough times—especially after Mariah Drayson’s dream marriage ends in heartbreak. Now the gifted baker has been handed a once-in-a-lifetime opportunity: running the Seattle branch of her family’s legendary Chicago patisserie. The competition is stiff. Until high-end coffee importer Everett Myers comes up with a sinfully tempting proposition. Hot off the press, today I’ve released Unchained Hearts, a follow-up to my popular Harts of Arizona series. Below is a snippet of the first book in my Hart sisters’ trilogy: Still smarting over her divorce and steadily gaining weight, full-figured New Orleans’s restaurateur London Hart never expects to fall hard for ex-Special Forces officer Chase Tanner. Chase is just as reluctant to fall in love with the chestnut beauty after finding his ex-wife cheated with his best friend while he was deployed. But the chemistry between the couple is too hard to ignore. Soon they’re embarking on a passionate affair. But Chase is suffering from PTSD and refuses to get help. Can London help free Chase of his demons and show him love is even better the second time around? 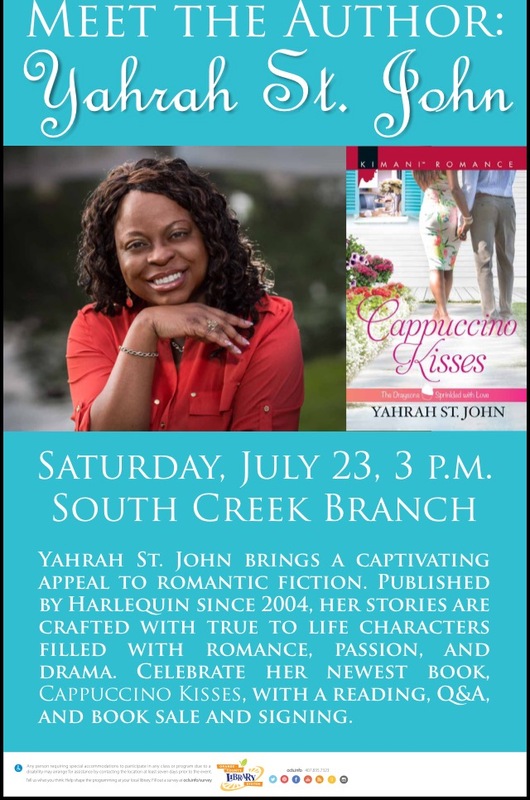 Want to meet me in person & get you’re an autographed copy of Cappuccino Kisses or Unchained Hearts? Join me on July 23rd @ the South Creek branch of the Orlando Library from 3pm-4pm for a Reading, Q&A and Book signing Event. While you’re devouring those books, I’ve finished up editing my January 2017 Kimani Romance release Taming her Tycoon. This is the first book in a duo series titled Knights of Los Angeles. Corporate raider Lucius Knight is desperate to learn about his paternity but not as much as he wants Naomi Brooks and her organic products company. Can he convince her that a liaison can be mutually beneficial in and out of the bedroom? Never one to rest on my laurels, this summer I’m writing a new Kimani romance continuity trilogy titled Miami Seduction. I’ll team up with two of your favorite Kimani authors Sherelle Green and Pamela Yaye to give you a peek into the Millionaire Moguls of Miami. Each of us will write a book in the series, so you’ll get a different take from each author. That’s all I’m going to tease you with for now, but expect Miami Seduction, the first book in the series come June 2017. Well, that’s all I have for now folks. Stay tuned for another edition in the world of YSJ.